Kick the tires and light the fires: it’s springtime and that means it’s time get out and drive! But when a bogey up ahead paints you, smart drivers with the reassurance of a Valentine One won’t have to jink their ride. Even smarter drivers would have ECM that self-deploys. The game for our “blue team” is all about technology: having it, knowing how to use it, ensuring that you do at any and all times. Getting splashed for 1 over on a downtown hop makes for a Charlie Foxtrot kind of day. On the side of the “red team”, it’s more about tactics, techniques, and procedures and less about technology. Patrol patterns, places to hide, dirty tricks, and having to follow established procedure including the required training and calibrations. The basic radar technology hasn’t changed in years, not counting unmanned radar (inevitably found unconstitutional when taken to the highest courts). But prowl car technology has. Given the retirement of the Crown ‘Vic, Ford has a new generation of police vehicles. That, thanks to Ford, saves taxpayers significant funds by using up to 35% less fuel. And they accelerate faster after pulling a bat-turn. Fortunately for the blue team though, the eyeball profiles of both vehicles are even larger than ever – making it even easier to check your six (and your twelve) when the red team is hiding in traffic, behind billboards, or even here. DEARBORN, Mich., March 16, 2012 – With experts predicting fuel prices are headed for record highs this year, the fuel efficiency of the new Ford Police Interceptors has the potential to help America’s cash-strapped cities reduce their fuel bills. Ford engineers tuned the all-new Police Interceptor sedan and utility vehicle models to save fuel even when they are standing still, with no sacrifice to pursuit performance. The city and highway fuel economy ratings for the new Police Interceptors have increased by an impressive 25 percent over the retired Crown Victoria. But many law enforcement vehicles spend the majority of their lives idling, and that is where the new models can provide even more fuel savings. “Our latest fuel-efficient V6 engines deliver on our promise for increased performance and improved economy, while providing government agencies with a money-saving solution,” said Bill Gubing, chief engineer of the Ford Police Program. 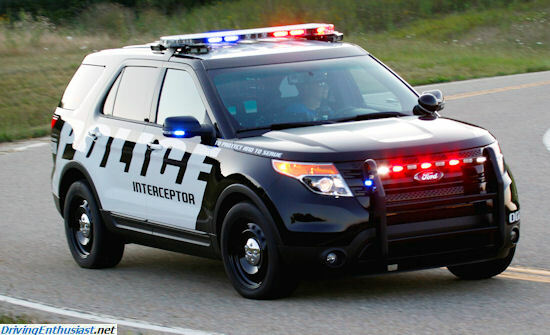 The Police Interceptor sedan and utility vehicle that are now being delivered to law enforcement agencies are available with efficient powertrain packages that provide more performance and better fuel economy, and are paired with standard and exclusive all-wheel drive for optimized traction and control. A recent study of police car use in Ottawa, Canada, showed the average police vehicle idles for up to 6.7 hours in every 10-hour shift. 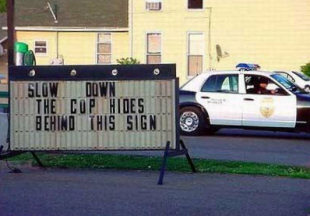 And, according to Police Fleet Magazine, the typical police vehicle wastes half a gallon of fuel for each hour it idles. For example, a 35 percent fuel economy gain during idling for a government agency with 100 vehicles would save taxpayers $153,300 per year with gasoline prices at $4 per gallon, if the vehicle idled for a minimum of three hours per day for two shifts. The 3.5-liter V6 engine in the Police Interceptor sedan uses 35 percent less fuel idling than did the 4.6-liter V8 engine in the Crown Victoria. The 3.7-liter V6 in the Police Interceptor utility uses 32 percent less fuel when idling than the Crown Victoria’s engine. “Our extensive experience with the Crown Victoria and feedback from our Police Advisory Board helped us develop the next-generation Police Interceptor to be a no-compromise vehicle that can easily be outfitted to meet the needs of individual agencies,” said Lisa Teed, Ford marketing manager for Police Interceptor. All three Police Interceptor engines feature double overhead cams, four valves per cylinder and Ti-VCT, or twin independent variable camshaft timing, plus several other high-tech features that improve fuel economy at idle and at speed without sacrificing the performance that is required by law enforcement. 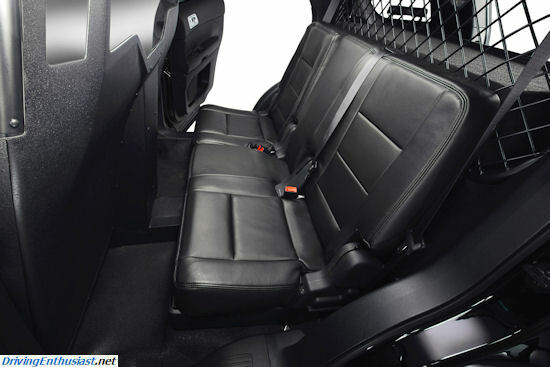 An example of how Ford engineers improved the fuel economy of both Police Interceptor models, beyond the powertrain changes, is outfitting the vehicles with EPAS, or electric power-assisted steering. The old-style hydraulic power steering system found on competitive police vehicles, such as the Chevrolet Caprice PPV and Dodge Charger, forces the engine to work harder – and waste fuel – at idle because the pump runs whenever the engine does. When a Ford Police Interceptor is idling, no energy is consumed by the steering system until an officer turns the steering wheel. Other fuel improvements come from optimizing the energy consumed by the air conditioning compressor and alternator. 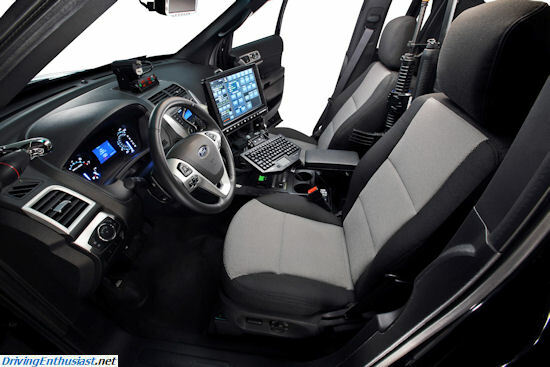 Working with Ford’s Police Advisory Board, which consists of law enforcement professionals from the United States and Canada who contributed to the development of these vehicles on attributes such as safety, performance, durability, driver comfort and functionality, the new Police Interceptor vehicles are purpose-built to meet the requirements of this demanding industry. LOS ANGELES, Nov. 23, 2011 – The all-new Ford Police Interceptor® sedan and utility vehicle posted class-leading figures in the complete series of performance tests conducted by the Los Angeles County Sheriff’s Department (LASD). 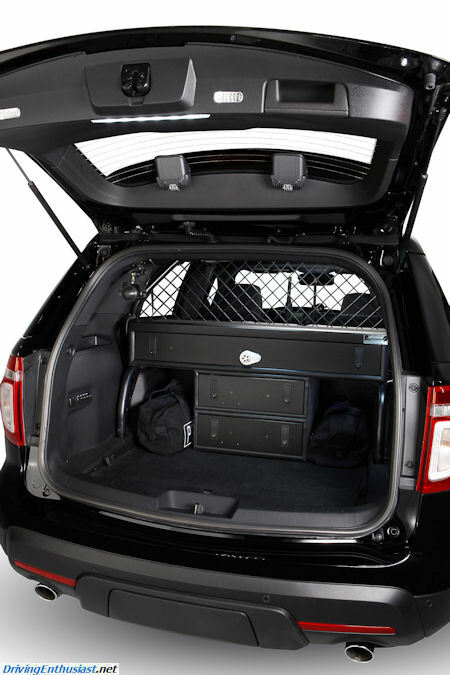 The entire portfolio of Police Interceptor vehicles passed the extreme testing conducted by the LASD and proved to the public and the law enforcement industry that Ford delivers purpose-built, pursuit-rated Police Interceptor vehicles. The annual test to validate pursuit performance on police vehicles is a joint evaluation conducted by the LASD with the support of the L.A. Police Department. To match real-world patrol conditions, emphasis is placed on a semi-continuous run of 32 high-speed pursuit laps to test for brake and tire durability, powertrain robustness and high vehicle temperature driveability. The 3.5-liter EcoBoost® all-wheel-drive sedan posted the fastest acceleration times of the event. “EcoBoost powertrain performance is optimized for closing speed and maximizing takedowns, thus preventing high-speed pursuits from even forming,” said Bill Gubing, chief engineer for the Police Interceptors. The EcoBoost-equipped Police Interceptor sedan completed the 32-lap, high-speed pursuit test posting the fastest average lap time, which was roughly two seconds faster than the V8 competitors. Not to be outdone, the 3.7-liter Police Interceptor utilities completed the grueling 32-lap tests, and the all-wheel-drive variants all posted faster times than their competitors by roughly two seconds per lap. The Police Interceptor utilities also performed well in the braking event by stopping eight feet better than direct competitors. The 3.5-liter Ti-VCT sedans completed the 32-lap high-speed pursuit test, outperforming the outgoing Crown Victoria. The Ti-VCT sedans also shined in the city pursuit test, posting times better than the V8 competitors. The city pursuit testing is a series of short straights and quick turns to simulate a tight, city-style pursuit. The event tests the vehicle’s driving dynamics and ease of pursuit driving in urban environments. Building on more than 15 years of leadership, Ford took the key product attributes that made Crown Victoria Police Interceptor the leading law enforcement vehicle and increased the next-generation product’s capabilities including the first and only pursuit-rated all-wheel-drive police vehicles. 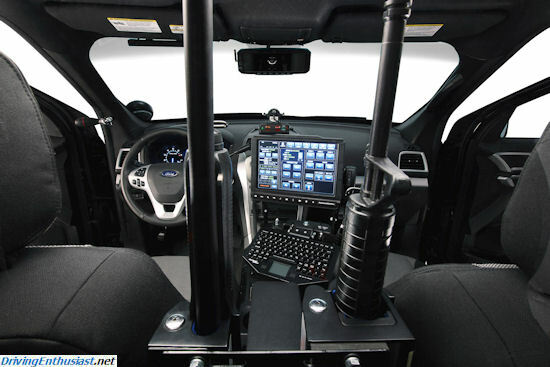 Now police departments and other law enforcement agencies can get an all-new, American-made vehicle with the same durability and price range as the popular Crown Victoria. The new Police Interceptor sedan and utility vehicle will be built at Ford’s Chicago Assembly Plant. Working with Ford’s Police Advisory Board consisting of law enforcement professionals from the United States and Canada who provided feedback on attributes such as safety, performance, durability, driver comfort and functionality, the new Police Interceptor vehicles are purpose-built to meet the requirements of this demanding industry. To view the results of the Los Angeles County Sheriff’s Department testing, visit http://www.lasdhq.org/sites/car-test/index.html. 2010 Taurus: What were they thinking?